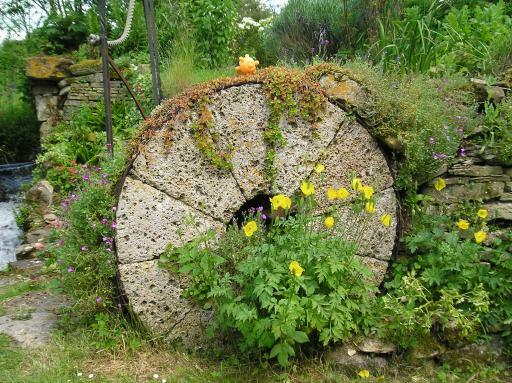 Today, a mysterious object appeared in the garden upon the Stone Disc. We are all excited and wondering if it is of an extraterrestrial or of a transdimensional nature or possibly, if we are really lucky, both! None of us have yet gone out to explore the object properly, nor have we tried to communicate with it yet, but we have high hopes that here at last we might find some intelligent beings on the Earth with which we can have meaningful conversations. Oh how I would love to discuss the principles of gravitational lensing and the implications of interstellar communications with someone that actually understood the vector calculus properly and isn’t Alice. (She says she would just like to clarify that this is because I don’t understand vector calculus and it is always her who actually has to do the maths – but I think it should be noted that I only let her do it to keep her happy). Still, we will hopefully be mounting an expedition tomorrow, which should be loads of fun! I will let you know how it all goes my next post! Hope to have exciting things to tell you next week. we saw some wigglypets today how do you make them!? Ah you must have been at the Arts and Craft Fair in Cranham where a human friend of ours called Sarah was attempting to find people who were happy to be part of the adopt a wiggly pet scheme. You see we thought it would be a good idea – us being naturally helpful creatures if we got out into the world and helped a few more people rather than just mucking about feeding kittens and babies all day. Have you adopted one of us? I think the Wiggly Pets are sooo cool. I have got 3 at home that I got at a Cranham fun day. It’s quite fascinating. Your blog is really interesting. To have a good site you should not only to post smth, but do it with your soul. You cope with it.